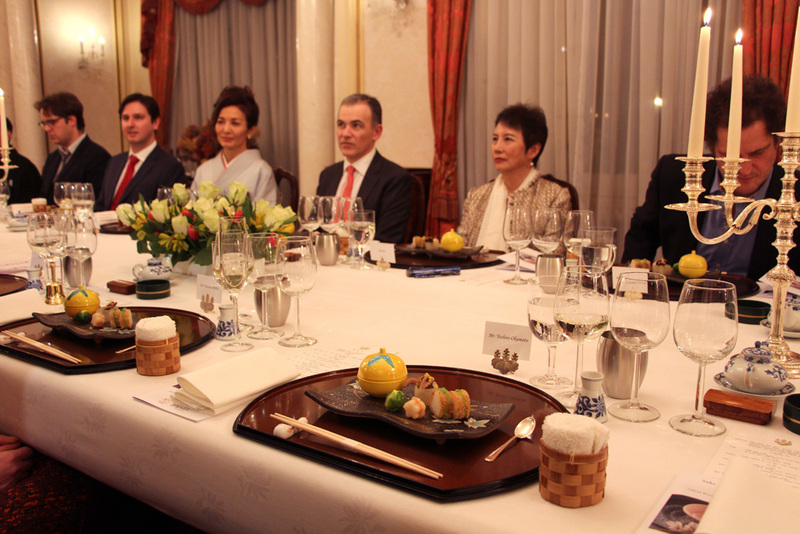 This spring, in an effort to raise the profile of sake internationally, the Japanese Sake and Shochu Association (JSS) and the Embassy of Japan co-hosted an exclusive sake and washoku dinner at the official residence of the Japanese ambassador in London. 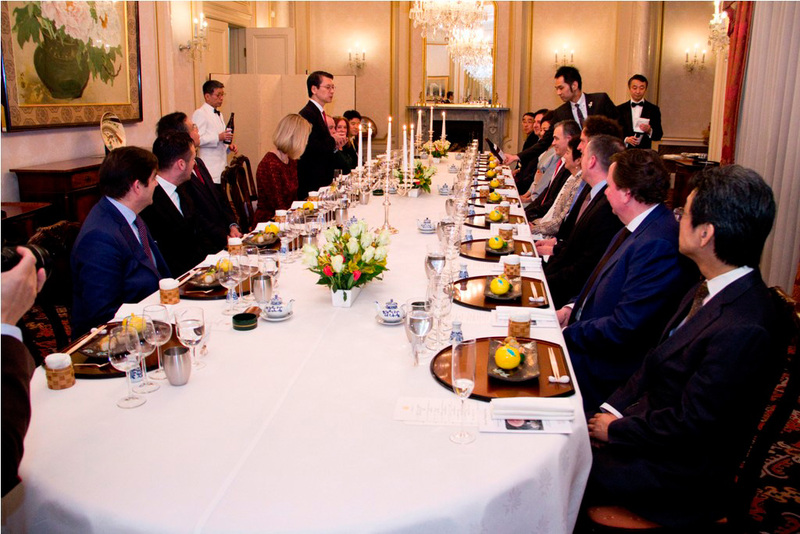 Twelve distinguished guests including Mark Flanagan MVO, the royal chef from Buckingham Palace, representatives from the UK Parliament and world media took delight in the heartfelt hospitality and exquisite pairing of sake and a seven course kaiseki dinner created by the Ambassador’s chefs. Mr Yoshiro Okamoto, the vice chairman of JSS and Mr Koichi Saura from Urakasumi brewery flew in to London and co-hosted the event with the Ambassador Mr Keiichi Hayashi and Rie Yoshitake. The Japanese media kindly joined the evening to speak with guests and reported this memorable sake evening through television and national news. 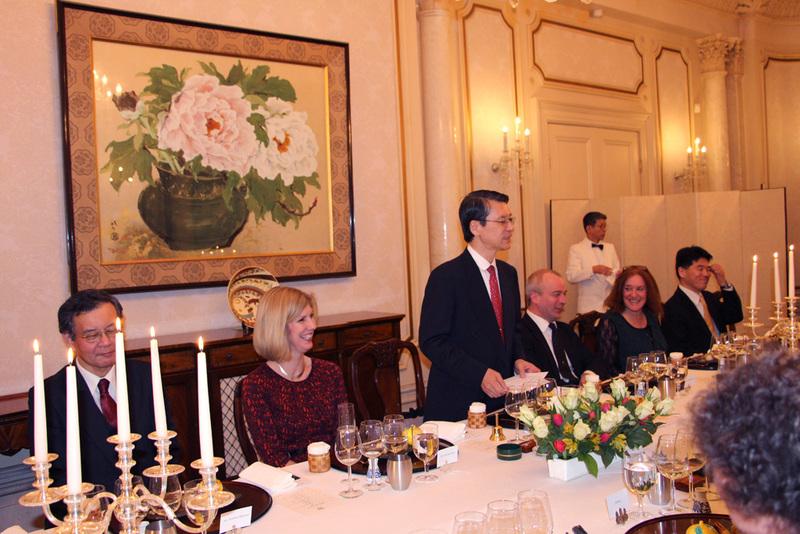 It was one of the most high profile dinners ever organised by the Japanese sake industry in the UK. What must have surprised our guests was the diversity of sake. Many people in Europe may still think sake exists in only one variety, if not hot or cold, but there are many varieties of sake to enjoy, depending on the occasion and food to drink with. This special evening started with a vigorously refreshing low alcohol sparkling sake. During dinner, we showcased floral, almost fruity and light Ginjo sake to compliment the delicate Kaiseki menu, then cloudy sake for stewed scallop with ginger, and sensational Dasai 39 for fresh sashimi. For juicy and richly flavoured wagyu beef, aged sake brewed in 2009 by Urakasumi was served. All sake was served chilled or cold to drink just like wine, except one sake style called Yamahai which was served warm in a tokkuri and sakazuki, so that guests and hosts exchanged a traditional ritual to serve each other’s cup with the saying ‘Kanpai!’. Maccha ice cream and desert plum sake combined beautifully as a finale. As the night went on, guests sipped an astonishing digestive called Time Machine, made by the only English master sake brewer in Japan, Philip Harper, using an ancient sake making technique. It sounds like an alcoholic evening but quite a few guests mentioned on the following day that they felt great and looked radiant without any hangover. 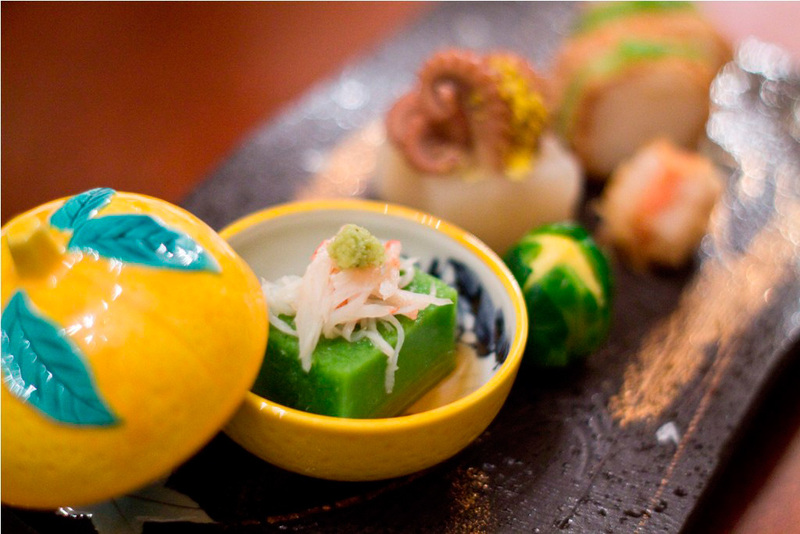 We were glad to see the myth of sake’s ‘alcoholic horror’ is fading away steadily. We hope many people will forget the prejudice and bad experience of poor quality sake, and will start appreciating fine sake as a choice for the everyday drink at home. 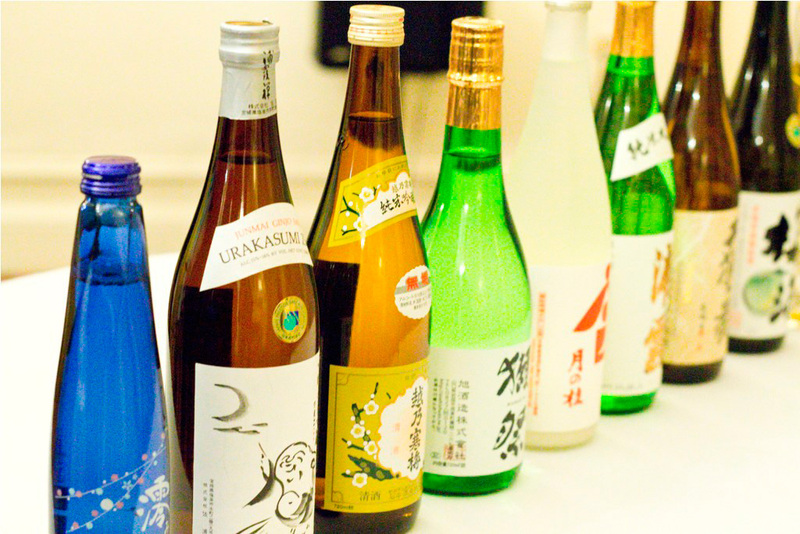 The nine brands of sake served were Shochikubai Shirakabegura MIO sparkling sake, Urakasumi Zen, Koshino Kanbai Muku, Dassai 39, Tsukino Katsura Nigori, Urakasumi Junmai Daiginjo Koshu 2009, Urakasumi Umeshu and Tamagawa Time Machine.